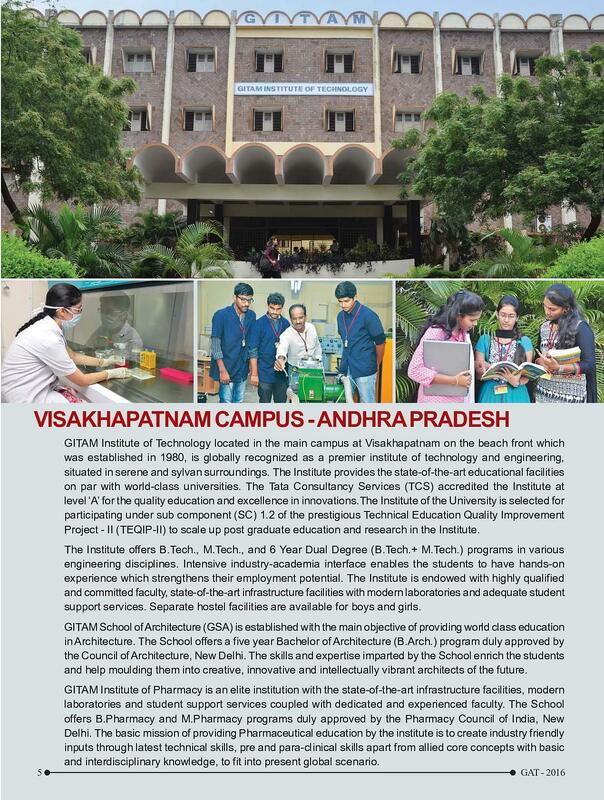 The GITAM Institute of Technology was established in the year 1980 known as one of the best institutes for Technology in Visakhapatnam. 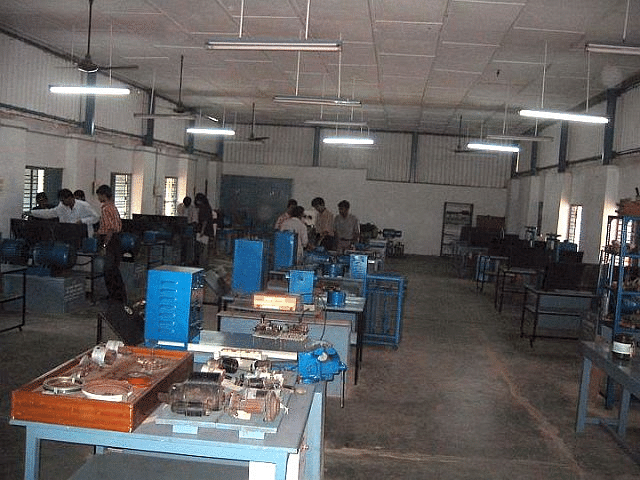 It was the first private institute in Andhra Pradesh to receive university status. 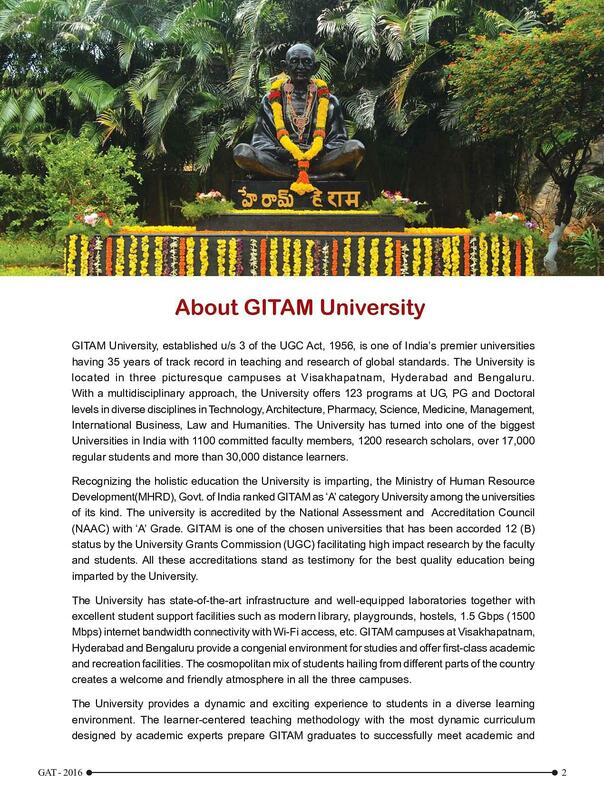 GITAM IOT offers B.Tech and M.Tech at undergraduate and postgraduate level and Ph.D. programmes in all engineering disciplines. The programmes offered to go beyond classroom learning and aim at the development of students into effective and efficient individuals, technocrats and thorough professionals. The GITAM Institute of Technology admissions is granted on the basis of a common online Entrance Test. GITAM IOT offers 9 specialized undergraduate, 16 specialized postgraduate and Ph.D. programmes in all engineering disciplines. 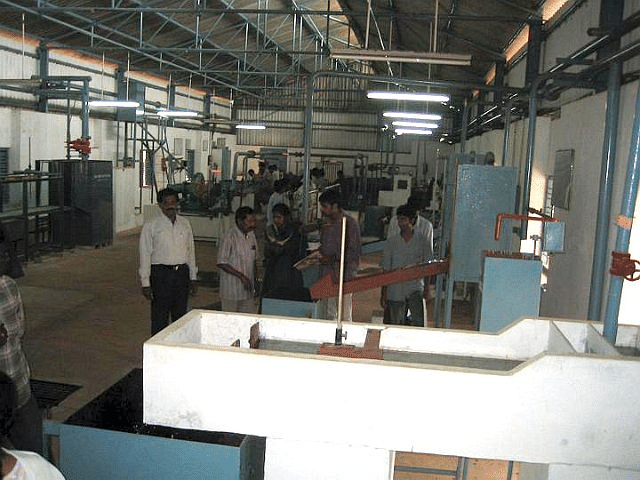 The 4 years full-time B.Tech program at GITAM IOT offers specialization in Biotechnology, Civil Engineering, Computer Science & Business Systems, Computer Science & Engineering, Electrical & Electronics Engineering, Electronics & Communication Engineering, Electronics & Instrumentation Engineering, Industrial Engineering, Information Technology, and Mechanical Engineering. Pass in 10+2 from a recognized central/state board or its equivalent, minimum 60% aggregate marks in Mathematics, Physics & Chemistry. Rank obtained in GAT (UGTP). 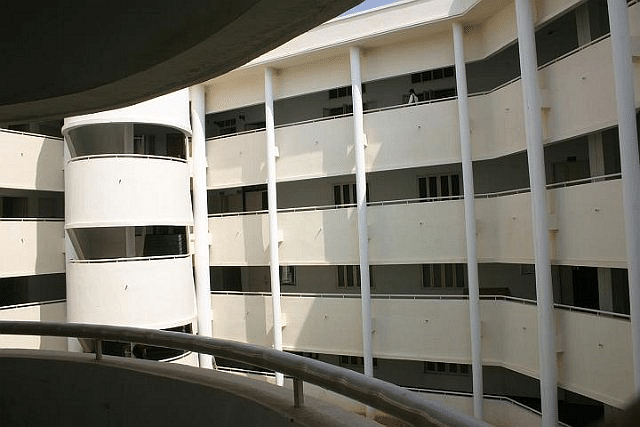 The M.Tech program at GITAM IOT is a full-time 2 years program offers specialization in Biotechnology, CAD/CAM, Computer Science & Technology, Cyber Forensics & Information Security, Data Sciences, Digital Systems & Signal Processing, Electronic Instrumentation, Information Technology, and so on. First class or equivalent grade in the qualifying examination from the recognized university with a minimum of 60% aggregate marks and rank obtained in GAT (PGT). 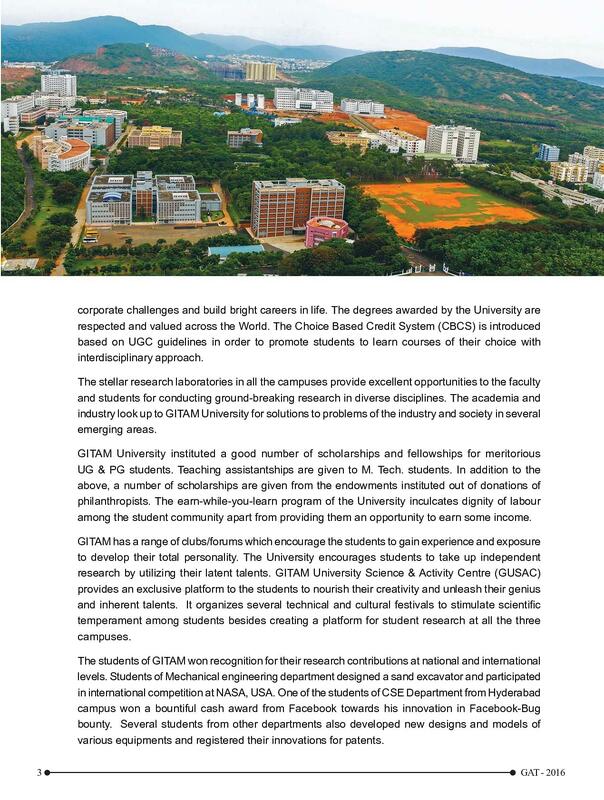 The Ph.D. program at GITAM IOT is 3 years (Full Time) and 4 years (Part Time) provides students an opportunity to research in specialized subjects like Biotechnology, Civil Engineering, Computer Science, Electrical & Electronics Engineering, Electronics & Communication, Electronics & Instrumentation, Industrial, IT, and Mechanical. ME/ M.Tech or equivalent degree in the concerned branch. BE/ B.Tech/ AMIE in any branch of Engineering or its equivalent. GITAM IOT Placement cell providing training for the development of integrated personality. The institute has collaborated with high reputed companies such as TCS, Wipro, Accenture, Tech Mahindra, HCL, Mozilla, Infosys, IBM, which recruited students every year around. In GITAM every student will experience a best college life. Loads of fun, lot of knowledge and lastly best memories. 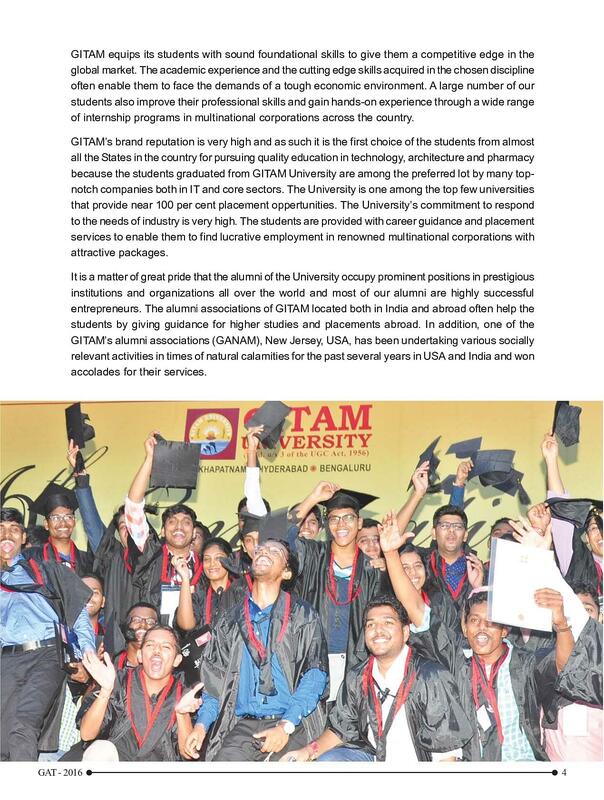 Best college experiences can be fulfilled in GITAM. Yes the college management and the curriculum is nice but the college fees is not affordable to the every student as it is increasing every year. Yes, the college management and the curriculum is nice but the college fees are not affordable to every student as it is increasing every year. 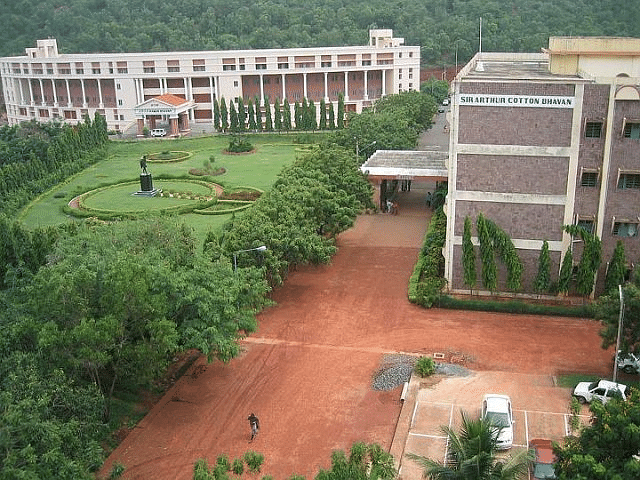 1) very large campus covered with greenery. 2) a big ground for playing basketball, volleyball, cricket, football etc., and also one indoor stadium. 3) Top notch faculty mostly from IITs 4) banking facilities are available. 5)Few other time passing zones like cafeteria, library, lawns etc. 6) GITAM medical college for any health related issues. On entirety I like being here at gitamuniversity which is one of the chill colleges providing nice facilities and interactive faculty..
First of all one should complete there intermediate with MPC as their stream and should have scored 60 in main courses. For getting a seat in GITAM one should write GAT exam which is conducted by the college authority or you can buy a seat under management quota . I scored around 100 which ranked me in 7000. This score is pretty enough to choose any of the required branch which you might like. "My college is very nice"
Myself sai teja ..Got into this college GITAM. Institution of technology... Visakhapatnam by writing a exam called GAT conducted by the Gitam university..